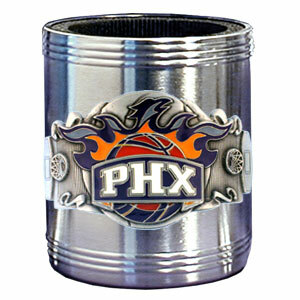 This NBA Phoenix Suns stainless steel can keeps canned beverages cool in style. 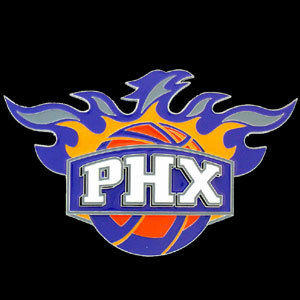 Team colors are expertly enameled on emblem depicting the Phoenix Suns team and the city they represent. Check out our entire line of NBA merchandise! 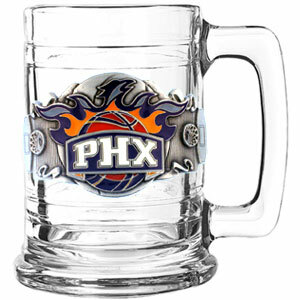 This NBA Phoenix Suns colonial tankard has a uniquely sculpted and enameled emblem that depicts the team and community. 15 oz capacity. Check out our entire line of NBA merchandise! 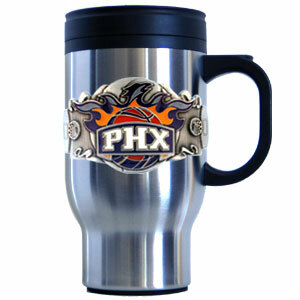 This NBA Phoenix Suns stainless steel travel mug has a uniquely sculpted and enameled emblem that is designed to depict the bright lights of LA and the Lakers. Its 18-ounce capacity will keep your drink hot or cold wherever you may be. Looking to show support for your favorite NBA team, Boston Celtics, Los Angeles Lakers, New Jersey Nets, Utah Jazz and the list goes on just like our NBA selection. Need basketball memorabilia and collectibles for your home, office or that special person? Take a look at our amazing line up of sports memorabilia and collectible products here at Crazed Out Sports!